As expected Google unveils their new Nexus 7 tablet at the Google event a few days ago. It's a $230 tab with 7" 1920 X 1200 pixel display running Android 4.3. It's the highest resolution 7" display on a tablet. The screen also promises a 30% wider color gamut. Asus made Nexus 7 has a Snapdragon S4 Pro with quad-core Krait processor at 1.5GHz, 2GB RAM and Adreno 320 inside. The main camera is 5 megapixel shooter capable of handling 1080p video. At the front it has a 1.2MP front-facing camera. It also has a SlimPort, which means you can get HD video out of the microUSB port. Other connectivity features are dual-band Wi-Fi a/b/g/n, Bluetooth 4.0 (Android 4.3 adds native support for 4.0 + LE) and NFC. Wireless charging is also supported. While the display size was kept the same, the new Nexus 7 is smaller. Google and Asus shaved off 1.8mm off the thickness, 2.8mm of the bezels on either sides and reduced the weight by 50g. Google kept well-liked the soft touch back. For storage, there's 16GB for the base model, $230, and 32GB for $270. Those prices are for the Wi-Fi only model, the 4G LTE model comes in 32GB only and costs $350. 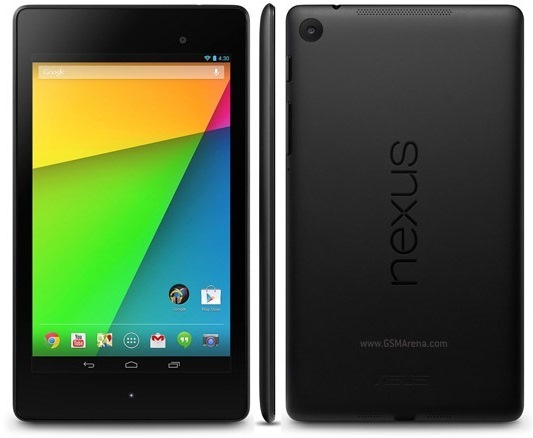 Google announced the Wi-Fi and 4G LTE models of the Nexus 7 from the get go this time around. One device will be able to use 4G from AT&T, T-Mobile and Verizon, no different versions required. The Nexus 7 2 will be available starting July 30 through the Google Play store and a number of retailers including Best Buy, GameStop, Walmart, Staples, Amazon.com. In the coming weeks, Google will expand availability for the 2nd generation Nexus 7 to Canada, the UK, Germany, France, Spain, Australia, Japan and South Korea.